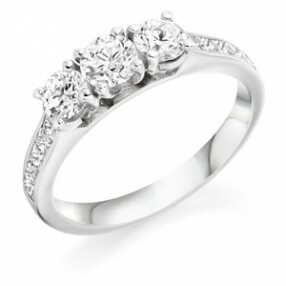 Diamond ring featuring three round brilliant cut diamonds, with the centre diamond being slightly larger. Accentuated by the additional sparkle of five princess cut diamonds channel set in each shoulder. Wedfit (allows your ring to sit flush with a wide selection of our wedding rings, leaving out the necessity to make individual fitted wedding rings).